ROCK HILL, S.C. — It was billed as a heavyweight fight in Winthrop Coliseum Thursday night, a battle of the Big South’s top two teams.Winthrop punched. Asheville countered. Both teams hit the mat. The homestanding Eagles, though, landed the final blow, defeating the visiting Bulldogs, 76–73, before a spirited crowd of 3,215 fans in a nationally-televised tilt. Asheville (13–7, 5–2 Big South) controlled much of the opening twenty minutes, getting a combined 25 points from juniors Ahmad Thomas and Raekwon Miller to take a 41–36 lead to the halftime break. McDevitt’s club saw one of those advantages he described, as a 30–28 Asheville lead ballooned to 11 on the strength of a 9–0 Bulldog run over a 1:44 span. Winthrop (14–4, 6–1) quickly returned serve to secure the interval margin. The visitors jumped back out to another double-digit lead as the half began. Winthrop got a three-point play from Xavier Cooks to knife the advantage back to single digits, then Asheville countered with a MaCio Teague jumper to extend the lead to nine at the 17:05 mark. That’s when Winthrop coach Pat Kelsey’s desired calling card made a much-needed appearance. That Teague basket proved to be the only field goal the Bulldogs could secure for 11-plus minutes of game time, as the Eagle defense stiffened and held the productive Asheville offense at bay. That defensive firepower was only truly countered by Asheville’s prowess at the free throw line. After Winthrop built an eight-point advantage at the seven-minute mark, Asheville went on a 13–0 burst to take a five-point lead, with seven of those points coming from the line in just over two minutes. McDevitt opined that the free throws may have actually held back his club. Despite those struggles — the Bulldogs were 6-for-22 from the field in the second half — they still held a three-point lead at the final media timeout, before Winthrop went on an 11–3 run to close the game. Kelsey remarked on the mood during that final timeout, and what led to the burst. Even after that run, the game came down to one frantic final Asheville possession. The Bulldogs’ MaCio Teague took one final three-point shot that would not fall, and the Eagles secured the ball as the horn sounded. The aforementioned crowd made a clear difference, as well. 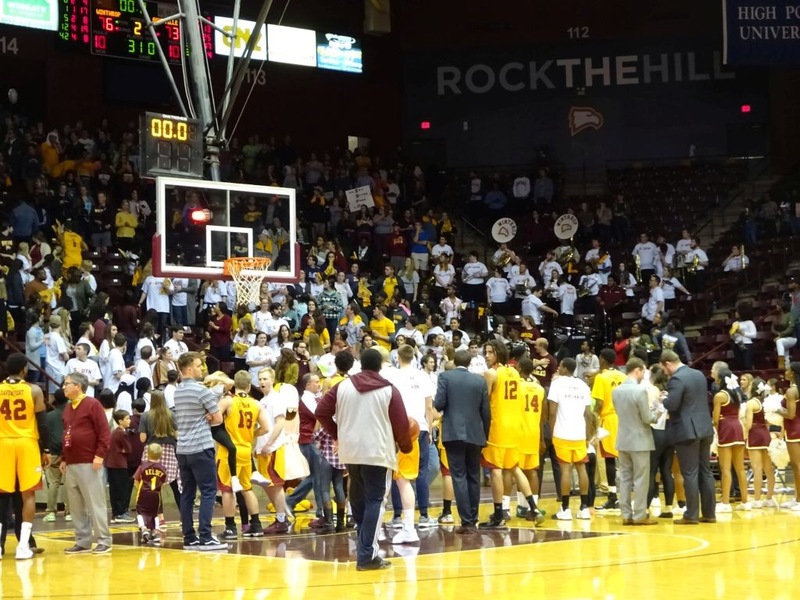 On a night heavily promoted by nearly everyone associated with Winthrop and the ESPNU cameras intently focused on the Coliseum, multiple sections filled with students — Kelsey estimated 1,200 of them — and were loud from open to close. Thomas led the Bulldogs and all scorers with 27 points on 10-for-20 shooting. Teague added 15 and Miller 13 for Asheville. Winthrop’s Xavier Cooks continued his recent success in recording double-doubles, scoring 19 points and hauling in 13 boards in 34 minutes. Rod Perkins tallied 17, while Anders Broman scored 12. Asheville returns home Saturday to face Campbell in a Big South conference tilt. That game is scheduled for a 4:30 (Eastern) tip in Kimmel Arena. Winthrop travels to Lynchburg, Va. to face fellow first-place team Liberty. That game is slated to begin at 7:00 Saturday night. ASHEVILLE (13–7, 5–2 BIG SOUTH): Thomas 10–20 4–6 27, Weeks 1–2 2–2 4, Vannatta 2–5 2–2 7, Robertson 0–2 0–0 0, Teague 5–14 5–7 15, Wnuk 0–0 4–6 4, Miller 3–8 5–7 13, Smith 1–2 1–1 3. Totals 22–53 23–31 73. WINTHROP (14–4, 6–1): Cooks 6–9 5–7 19, Okeke 2–4 0–0 4, Perkins 6–13 1–4 17, Johnson 1–11 5–6 8, B. Broman 0–3 0–0 0, A. Broman 5–9 0–0 12, Pickett 0–2 0–0 0, Ferguson 1–1 4–4 6, Prescott 1–2 0–0 2, Davenport 2–3 4–5 8. Totals 24–57 19–26 76. Halftime — Asheville 41, Winthrop 36. 3-Point Goals —Asheville 6–18 (Thomas 3–4, Vannatta 1–3, Robertson 0–1, Teague 0–3, Miller 2–6, Smith 0–1), Winthrop 9–30 (Cooks 2–3, Perkins 4–11, Johnson 1–7, A. Broman 2–6, Pickett 0–1). Fouled Out — None. Rebounds — Winthrop 40 (Cooks 13), Asheville 33 (Thomas/Teague 6). Assists — Asheville 12 (Vannatta 6), Winthrop 9 (Cooks/B. Broman 3). Total Fouls — Winthrop 23, Asheville 22. Technical — Cooks. A — 3215. Points in the Paint — Asheville 27, Winthrop 23. Points off Turnovers — Asheville 20, Winthrop 18. Second-Chance Points — Winthrop 16, Asheville 3. Fast Break Points — Asheville 13, Winthrop 5. Bench Points — Winthrop 28, Asheville 20.